We’ve a motley crew of chefs on the AWOL team with chefs who have been with us for 15 years to 15 weeks, even some new faces for the summer season, and we want to see more of you this summer. The AWOL #chefsummerselfie challenge is simple- we want to see you with your food, with our clients, out and about flying the AWOL flag or with each other- because we do from time to time let you loose together. We know you’re busy away out there, we want to see the many faces of the AWOL Team. We’ll be announcing a winner for the best #chefsummerselfie on September 1st, and keep your eyes peeled in the mean time for details of the prize! 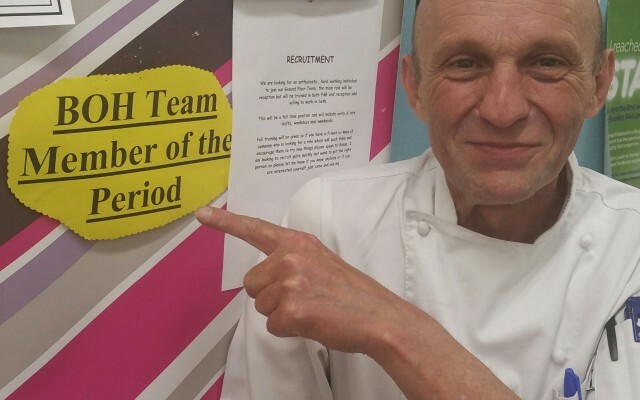 We’re kicking off with Boh- a long serving AWOL Chef based in the South Lakes, who found his name sake sign with one of our clients recently.